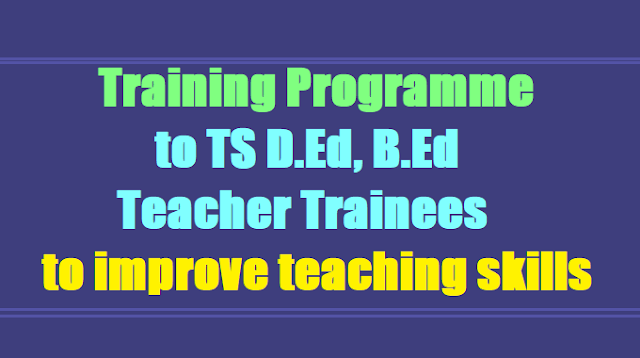 Sub: Imparting Lead India 2020 “Aap Badho Desh Ko Badhao” trainings to all B.Ed / D.Ed students to make them as teachers to build the Nation -reg. With reference to Commissioner and Director of School Education Memo.No.843/Planning-I/2016 Dated.20.07.2017, we will be deputing Lead India Master Trainers for imparting 2 days Lead India 2020 Aap Badho Desh Ko Badhao "మీ అభివృద్ధే దేశ అభివృద్ధి" trainings to all B.Ed/D.Ed students. There after we will be establishing Lead India National Club (LINC) of the college, under the Chairmanship of Principal with selected lecturers and students representing all departments and years of the college. These selected students will be given 3 days Training of Trainers (TOT) as Lead India College Change Agents. We request you to permit trained Lead India College Change Agents to train nearby Govt High Schools students to impart values, skills & goals. We shall issue social credits certificate for those who train minimum 4 nearby schools and conduct sustenance activities and send reports for your information as per LINC guide. You will also be happy to hear our former President of Dr.A.P.J.Abdul Kalam in his last massage to the nation, appealed to support the Lead India 2020 Movement. Link:https://youtu.be/3CxU6R77q4E. Hence under you leadership in your district we request you to instruct all Head Master’s of the district to conduct 3 days Lead India “Aap Badho Desh Ko Badhao trainings and open LINC in schools and do sustenance activities for next 3 years as per LINC guide so that values are established. Lead India Master Trainers and Lead India College Change Agents will contact school Head Master’s and conduct trainings to achieve “Banagaru Telangana”, dream of our Hon’ble Chief Minister and developed India dream of our former President Dr.A.P.J.Abdul Kalam and Hon’ble Prime Minister of India. Please feel free to contact us on leadindia2020.org@gmail.com for any further Information / Clarifications.